Directed by Clyde Geronomi, Hamilton Luske, Wilfred Jackson. 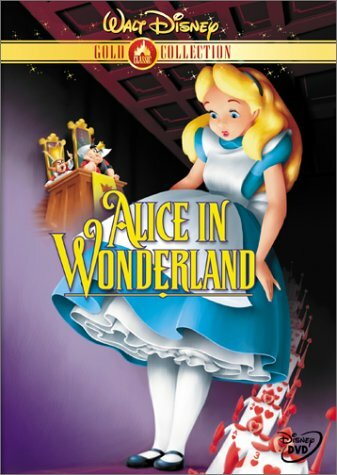 Alice in Wonderland is a delightful Disney version of Lewis Carroll's popular story. The story has been filmed many times - by Paramount with a large star cast including W.C. Fields and Gary Cooper in the '30s, a British star cast in the early '70s, including Peter Sellers and Dudley Moore, and for television in the '80s. This film marked a return of the Disney Studios in the late '40s and early '50s to full-length animated features: Cinderella, Peter Pan. It is beautifully drawn, the film captures the atmosphere of Lewis Carroll - but communicates it for a wide and universal family audience. 1. The perennial popularity of Lewis Carroll's story and characters? The tradition of visual presentations of drawing and film of Carroll's work? 2. The Disney style, the treatment and delight? The plot, the animation - period, characters, animals and humans? Humour and caricature? Colour, drawing, the quality of the compositions and movement? 3. The music and the songs? Carroll's words, contemporary lyrics, -Tweedledum and Tweedledee, the Mad Hatter and company, the Queen of Hearts? 4. The choice of voices for the types of character e.g. Ed Wynn, Richard Haydn, Catherine Beaumont as Alice? 5. The taking of Carroll's plot outline and compressing it to a length for family audiences, pace? 6. The portrait of Alice, her song, lessons, Dinah the cat, falling asleep, following the rabbit, her idea of reverse, the fall, the tunnel and its detail, her curiosity about the room, the key and the knobs, eating and drinking, tears and being washed away? An exciting opening for the film? 7. The Dodo and the Oyster Song? 8. The Mad Hatter, the March Hare, Doormouse? The mad tea party? The Unbirthday? The Cheshire Cat - and their appearance at the trial? 9. The cat, smile, jokes, mockery and movement, disappearing? Trouble? 10. The caterpillar and its hookah? And its enjoyment of playing with letters, song? 12. The hurry, the roses, painting of the roses red, the cards and the courtiers, the march, the comedy, the composition and design of these sequences? 13. The Queen of Hearts, enjoyable, villainess, her rage, croquet, the King? 14. The trial and jury, the witnesses, Alice, up and down - the final mad chase? 15. The end and her waking up, dream and fantasy, Wonderland and nightmare?